As our family grows, my husband and I are constantly thinking and re-thinking what the perfect family home would look like for us (this comes naturally to an architect and designer--you should see us at restaurants--no napkin is left without a doodle, and my purse almost always carries a sketchbook if my husband is with me). Against our instincts (and probably the instincts of many), it's the small spaces that intrigue us the most. I've featured tiny homes in a post before, and although I don't think that would work for us in our current situation, it's not something we've ruled out for the more distant future. Small space living is not something we're accustomed to here. I mean let's face it. Big houses are a status symbol. It's not our natural tendency to "dream of smaller spaces." No one ever said "I wish I had less storage." You get the idea. So when we see someone pull it off--especially a family of four, like the home of interior designer Jessica Helgerson featured in the Houzz tour below, we take serious note. You may not relate to us. AT ALL. And that's totally understandable. But you have to admit as you scroll through the planning of this house--it's totally genius. The use of space is excellent. You can tell it's small, but none of it feels tight or crowded. Hats off to Jessica! 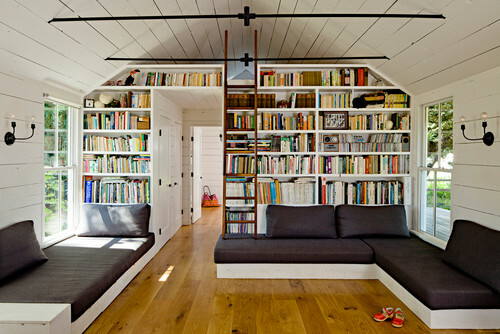 My favorite room (as I've seen and pinned on Pinterest) is the bunk room. A lot of parents of multiples argue that shared rooms don't work forever because children eventually need privacy. And while these kids aren't exactly teenagers yet, the bunk is designed (as many clever bunks are these days) with a cubby-like feel, so each bunk user is walled-in on three sides. It definitely lends itself to much more than just snoozing. So take a look for yourself. Even if the small space isn't appealing, you have to admit the design is very well executed. Not a space left un-used. What are your thoughts? Could you see yourself living here (with some adjustment, I'm sure)? Maybe just as a vacation home? ;) I hope it's at least inspired you to think outside of the ordinary home design!